To sell more than 5 vehicles a year in Wisconsin, you will need to get a Wisconsin dealer license. 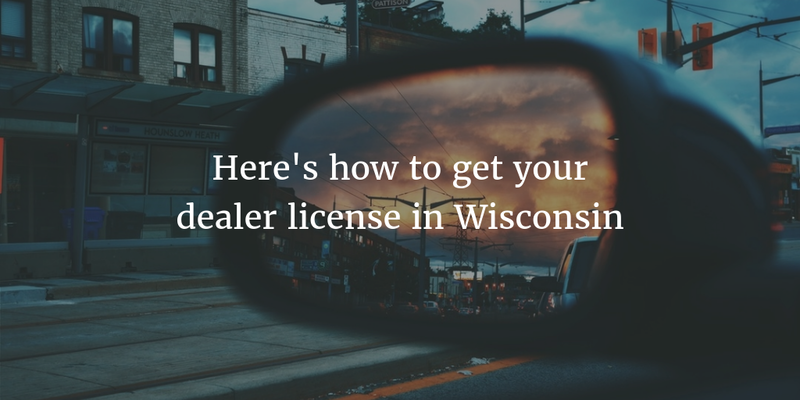 The Wisconsin Department of Transportation (DoT) offers over 10 types of dealer licenses, depending on the type of vehicles you want to sell and in what way. To get licensed you will need to fulfill the legal prerequisites, complete your dealer application and obtain a Wisconsin auto dealer bond. Read on for a full overview on how to open a dealership in ‘America’s Dairyland’! The retail dealer license is the one that allows dealers to sell vehicles to the public. The Wisconsin wholesale dealer license, on the other hand, allows dealers to sell vehicles only to other dealers but not to the public. Once you choose which license you would like to apply for, you have to prepare for covering the license prerequisites, as well as filing the necessary forms and documents. If you want to obtain a retail dealer license and be able to sell vehicles to the public, here is what you will need to do! Pay your licensing, plate and Department of Financial Institutions (DFI) fees. These are $40 for the license, $150 for the plates and $20 to the DFI. When you complete the above forms, you are ready to submit your application to the Wisconsin DoT by mail. The DoT will then process your application. If any information is missing, you can expect them to contact you to request that you provide the missing info to complete your application. Once your application is processed and reviewed you will hear from the DoT about the status of your license. Make sure to check the DoT’s instructions for filing your Wisconsin dealer license, if you have any questions about the process. Posting your $50,000 Wisconsin auto dealer bond is an essential requirement of the licensing process. Without a bond, you cannot open your dealership. Dealer bonds are a type of protection that the auto dealer must provide to the state and the public. They guarantee that dealers will comply with Wisconsin law and dealer regulations. If a dealer violates these laws, the bond makes financial compensation available to those who have suffered damages or losses as a result. To obtain your bond you needn’t pay $50,000, though! Getting bonded requires you to pay a small premium. Standard market rates are usually somewhere between 1% and 3% of the total bond amount if you have good financials, such as a high credit score. Read our surety bond cost guide to get a good picture of the factors that determine bond cost. If you’re curious about the cost of your own bond, you can get an entirely free quote by applying online right now. And if you have any questions regarding the bonding process or the bonding requirement for Wisconsin auto dealers, call us at 877.514.5146 anytime!